A charmingly illustrated and timely tribute to the women who broke glass ceilings in film and television, debuting during an historic time of change in the entertainment industry. 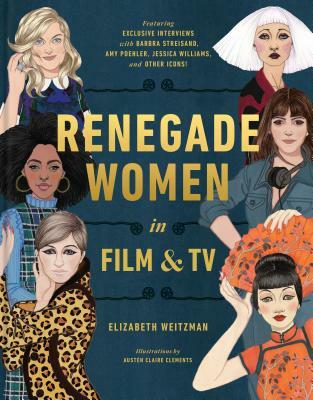 Renegade Women in Film and TV blends stunning illustrations, fascinating biographical profiles, and exclusive interviews with icons like Barbra Streisand, Rita Moreno, and Sigourney Weaver to celebrate the accomplishments of 50 extraordinary women throughout the history of entertainment. Each profile highlights the groundbreaking accomplishments and essential work of pioneers from the big and small screens, offering little-known facts about household names (Lucille Ball, Oprah Winfrey, Nora Ephron) and crucial introductions to overlooked pioneers (Alla Nazimova, Anna May Wong, Frances Marion). From 19th century iconoclast Alice Guy Blaché to 21st century trailblazer Ava DuVernay, Renegade Women honors the women who succeeded against all odds, changing their industry in front of the camera and behind the scenes. ELIZABETH WEITZMAN is a journalist, film critic, and the author of more than two dozen books for children and young adults. She currently covers movies for the Wrap, and was a critic for the New York Daily News for 15 years. She has interviewed hundreds of celebrities, and written about entertainment for the New York Times, the Village Voice, Marie Claire, Harper’s Bazaar, Interview, and many others. In 2015, she was named one of the top critics in New York by the Hollywood Reporter. She holds a Master’s degree in Cinema Studies from NYU, and is a longstanding member of the New York Film Critics Circle and the Society of Children’s Book Writers and Illustrators. Visit renegadewomen.net. AUSTEN CLAIRE CLEMENTS is a freelance illustrator and graduate of The School of the Art Institute of Chicago. As a Teen Vogue intern, her illustrations caught the eye of the Editor-in-Chief, Elaine Welteroth, who commissioned her to design a cosmetics case in an exclusive partnership with the magazine and Maybelline. Her work has been featured in Glamour, Teen Vogue, InStyle, PopSugar, and more.